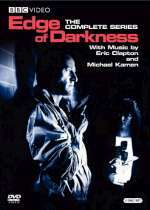 Edge of Darkness: Mystery and Suspense on Television. Police detective Ronnie Craven (Bob Peck) investigates the mysterious death of his own environmental activist daughter (Joanne Whalley) and becomes embroiled in a vast conspiracy within the nuclear industry in the suspenseful Edge of Darkness, a 6-part miniseries that aired on BBC in 1985. The series has a paranormal element in that Craven is advised by Emma during the investigation, but it isn't clear if she is a ghost or a manifestation of his mind.